Zeitgeist’s sunny patio. Photo courtesy of Zeitgeist. A chilly afternoon in the middle of December didn’t stop regulars from venturing out onto the patio of one of the Mission’s most popular bars, Zeitgeist. But the manager there, Gideon Bush, fears that the shadow cast by a five-story building expected to go up across the street just might. Bush said the building, a five-story, 28-unit mixed-use building with a ground floor commercial space, will cast a shadow on the beer bar’s popular outdoor space during its peak use times — March through October, he said, the shade would cost the bar business. “We are definitely pro-housing, and we want to work with these developers. We want to find a balance between both of our business interests,” Bush said. Zeitgeist and another neighbor have filed discretionary reviews against the project, meaning it will have to go before the Planning Commission for approval. In the review, the bar’s president, Klaus Burmeister, writes that the increased shadow would “impact 30 percent of our annual sales” and ultimately shut down the bar. “This impact will result in a short run reduction of staff, but in the long run is highly likely to ultimately shutter the business as the sunny beer garden, its prime asset, will be lost,” he wrote, adding that he fears for his customers’ “loss of privacy” from “roof-top gawkers.” He also raised concerns about the “inadequate parking” in the project, which will have 14 parking spots — the maximum allowed without additional review. Because Zeitgeist is a “world famous San Francisco destination,” Burmeister wrote, the bar should be protected and the project’s height reduced by two stories. The bar was added to the city’s legacy business registry in October. Bush, the bar manager, said he has yet to hear a definitive answer from the developer. A developer’s representative did not return a call for comment by press time. Bush said the shadow impact was based off of an independent study he commissioned, not the study done by the developer. Feelings on the patio Tuesday evening were mixed about the prospect of a building going up nearby. A table of regulars playing dominoes voiced dismay – “You mean we won’t be able to see the sunset anymore?” and “I wouldn’t stop coming here, but it would be a drag,” they said. 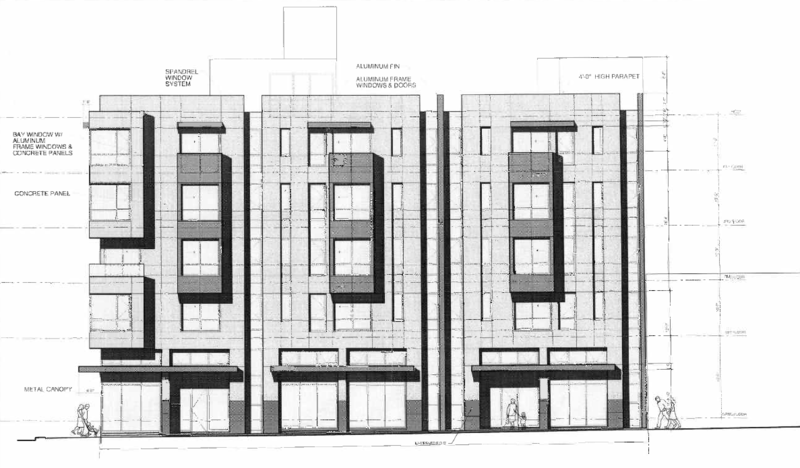 The renderings for the 28-unit project at 198 Valencia St. as seen from Valencia Street. 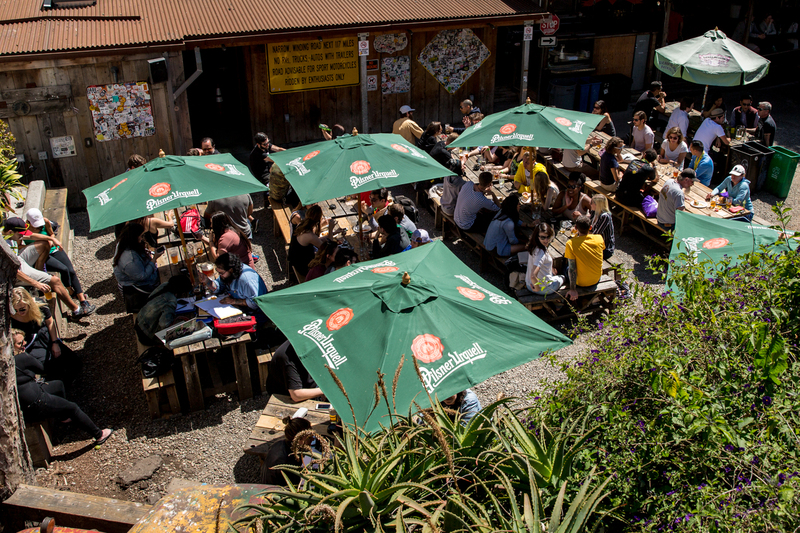 Though there wasn’t a clear consensus as to whether sunlight was crucial to patio-drinking, guests did seem to count the fact that an outdoor space exists at Zeitgeist as one of the bar’s most important features. “There’s a lot of reasons, but that’s just the number 1 reason,” said Charlotte Welch of the outdoor space. She usually comes in the summer, but with a guest in from Washington, D.C., a visit was in order. Roland Peters took shelter from the cold on the heated portion of the patio. Zeitgeist, he said, is his favorite spot in the city. Same for Jason De la Cruz, who also said the outdoor space is what distinguishes Zeitgeist. “It would change a little bit. It’s not like there’s a bunch of other tall buildings here. The outdoor space is specific to this place,” he said. His drinking companion that afternoon, Abby, said while shade wouldn’t stop her, in San Francisco, warmth is a factor. “It’s a nice place to sit in the sun, especially since it’s so cold and summers are so short,” she said. That’s fine they can file their appeal, but there is no legal right to a view or to be protected from shadows (there is only a city ordinance limiting shadows on public parks), so Zeirgeist has no reasonable legal position. What they want is the developer to pay them money. I get it. They probably will get a little payoff over it, but the Planning Commission will not side with them, and they know it. Howeve, they know appeals slow things down and add expense, so developers are likely to pay to make the issue go away. No, they just want to keep sunshine on the patio. As does most of the neighborhood, I reckon. The proposed building will have no effect on the sunshine on the patio. Zeitgeist’s DR request is nonsensical and should most certainly fail. It’s continually disheartening that this City’s policies continue to allow such spurious objections hold up much-needed housing creation. Do Mr. Burmeister and Bush even understand that the proposed 198 Valencia building (5-stories, 55′-0″ high) is directly due west and a full 82′-6″ feet way across the street from their patio? Sounds like they don’t have a clue about how the sun actually travels across the sky. Once the sun travels around towards the end of the day for it to even have chance to be blocked by the proposed project, it will be very low in the sky and close to setting! As it currently stands the building that is blocking — and will continue to block — the most sun on their outdoor space is their own 3-story building directly to the south! They’re flippant suggestion that 198 Valencia’s project sponsor lop 2 whole stories off the proposed project is patently absurd — it would likely result in cutting the projects dwelling unit count from 28 to 14. There is no way the developer or the Planning Commission is going to support this self-entitled and ignorant DR request. Mr. Burmeister and Bush should be ashamed of themselves. “See the sunset”? I have been to Zeitgeist many times and appreciate the sunshine on the patio – but you can barely see ANYTHING over that solid wood fence to the west, let alone the sunset. Without going out there and measuring, I could believe the sun might be blocked a little for the last bit of the day, but there is absolutely no way you can see the sunset from there.